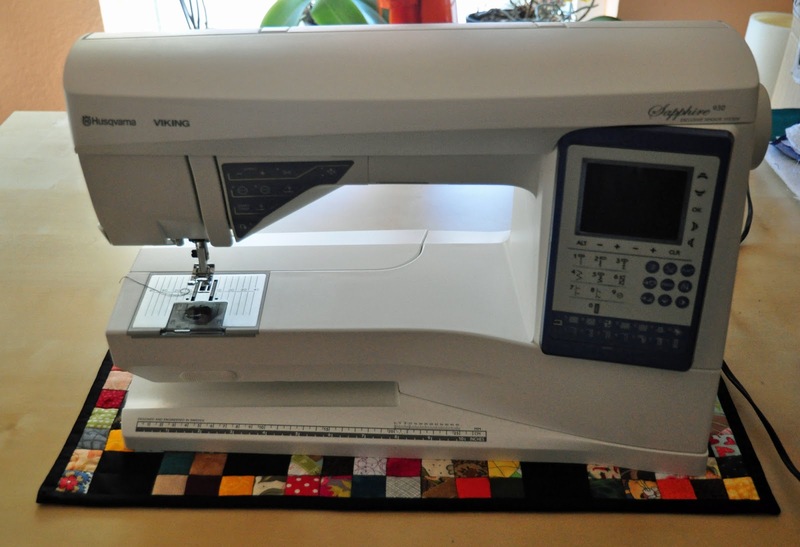 I decided I want a mat to place under my sewing machine. So I started to go through my scrap baskets (which is the place where I put all the really small scraps - less than 2 x 2 inches square), and cut anything that was still big enough into 1 1/2 inch x 1 1/2 inch squares. When sewing fabric this small together, you loose 1/3 of the size to the seam allowance. 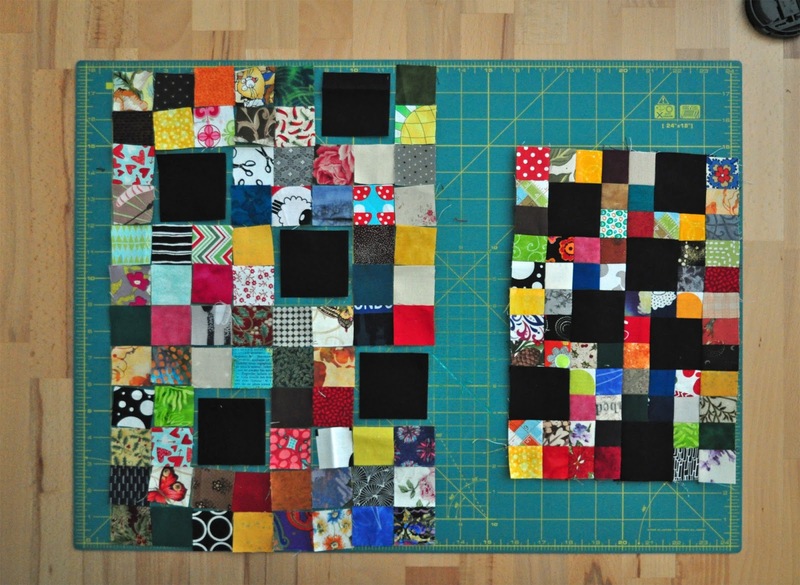 Left side is the same number of squares as on the right, but the size goes down from 12 x 18 inches to 8 x 12 inches. Eventually I ended up with a 21 x 12 inch large piece, which I quilted in the ditch and bound nicely. I fits perfectly under my sewing machine. 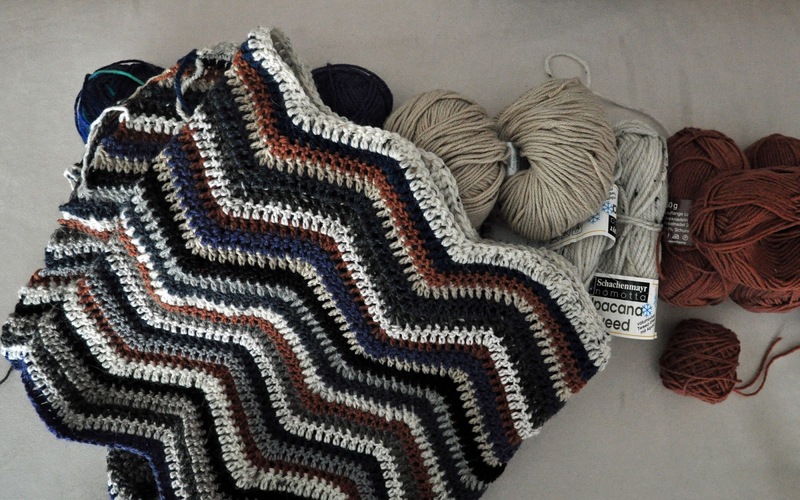 When I went through my yarn stash in Janauary, I noticed I've still got a lot of cotton scraps, so I decided to make another pair of my ever popular magic square potholders. The first pair went together quickly. It's a rather wild color combination. 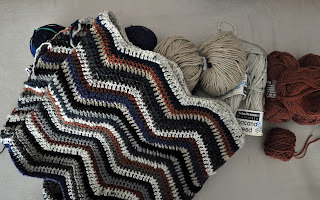 Except for the millions of ends to weave in (with those I don't trust just making a knot, even if it's on the inside and nobody will ever see it), they are quickly to make and a lot of fun. I already cast on the next pair. 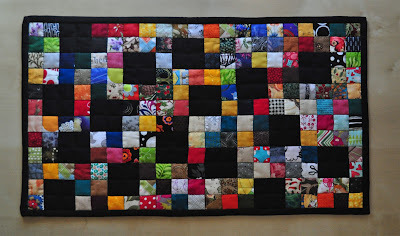 I've linked with Crazy Mom Quilts Finish It Friday. Last weekend I had a workshop at the Quiltmanufaktur in Frankfurt. The topic was 'Modern Hexies' and as I happened to have already a lot of hexies prepared I went to make a table runner (aim of the workshop was a pillow). Then we learned how to prepare the background and fix the hexies to it before sewing them on. As the sides of the hexies stay open when using this method, it's not recommended to make a quilt from it, but it's totally fine to make a pillow, a wall hanging, or, as in my case, a table runner. Fixing the hexies in such a way that they stay in place while sewing is the hardest part and I had to rip out a couple of them after the first rows were sewn. It's not perfect, but close enough for me. I did leave a couple of spots empty, which I think makes for an interesting effect. The table runner was finished and bound on Wednesday and went directly on to my table. I really like the effect and absolutely could think of making something like this again.